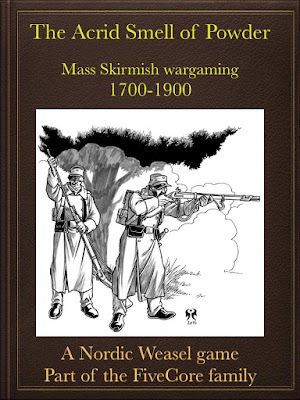 Welcome to The Acrid Smell of Powder - Mass skirmish rules for black powder warfare. What is Mass Skirmish ? It's "1 figure equals 1 soldier" warfare but on a grander scale than the norm. Written to be usable with any figures based 3-5 to a stand, you can grab your miniatures based for games like Fire&Fury and put them right on the table in a "what you see is what you get" skirmish fight, using close to realistic weapon ranges. The rules use a creative Initiative Dice system, adding uncertainty to what your troops can do each turn, without ever wrestling control away from the player completely. Combat is handled through the popular FiveCore system using a combination of "kill dice" and "shock dice" to resolve a volley of fire in a single dice roll, without looking up modifiers: Simply roll and you know if you hit them and if they are retreating. The close combat system attempts to portray the importance of morale and the relative rarity of hand-to-hand fighting: A well disciplined unit may be able to break through the enemy line simply by a determined advance. . . if they stand up to the enemy volleys that is. We round out the mechanics on offer with the "Flow of Battle" table, representing that your action is part of a greater battle: Flanks are menaced by cavalry, infantry columns advance and the skirmish lines are reinforced from the line. Of course should you wish to follow your skirmish company across multiple battles, we've provided for that opportunity as well. Mechanics are included for repeating and rifled weapons, allowing you to use the rules from the 7 Years War all the way to the Franco Prussian war (and possibly beyond). 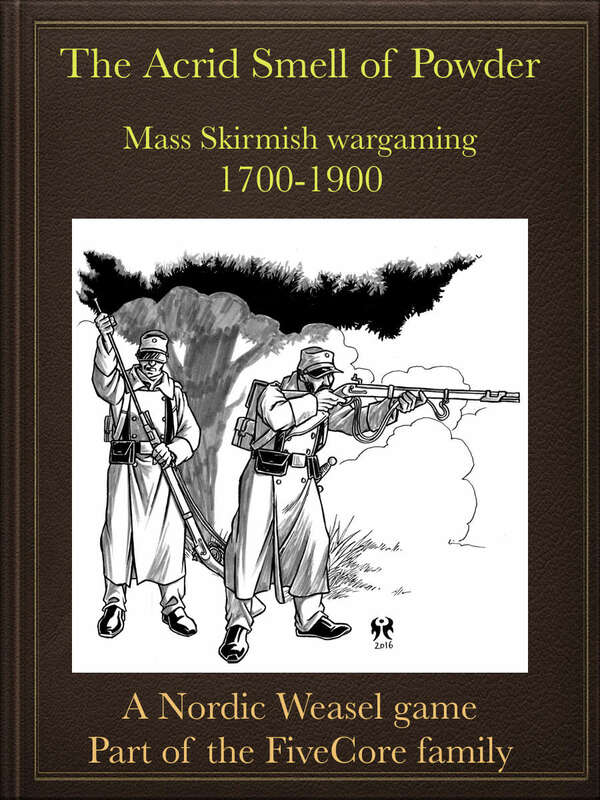 It is my sincerest hope that you will find The Acrid Smell of Powder to be a refreshing take on "mass skirmish" warfare in the age of black powder weaponry. Each troop stand represents 3-5 individual soldiers. A good starting battle might require 15-25 troop stands per side, plus a few individual leader figures. Options are provided for scaling up to quite large battles. Who said skirmishing had to be about 7 guys searching for a bag of potatoes? This is an Early Version of the rules. The core mechanics are fully operational though they will of course benefit from additional testing and tweaking. *Set-up instructions for randomized battles. *At least a rudimentary points system. *Promotion system for your leaders. *A bunch of optional rules, variants, rules for special troop types, early machine guns and all that jazz. *Illustrations, more examples and more general goodies. Most of these items are already completed, but i decided that it would be better to get the core rules out there in the wilderness for players to chop apart. That way, the core engine can be fine-tuned as much as possible, before adding all the chrome. We've endeavoured to make the Early Version as complete a game as possible. It is a complete game that you could get many hours of enjoyment out of. If you purchase the Early Version, when the full version is released, you will be able to get it by only paying HALF the difference in final price.